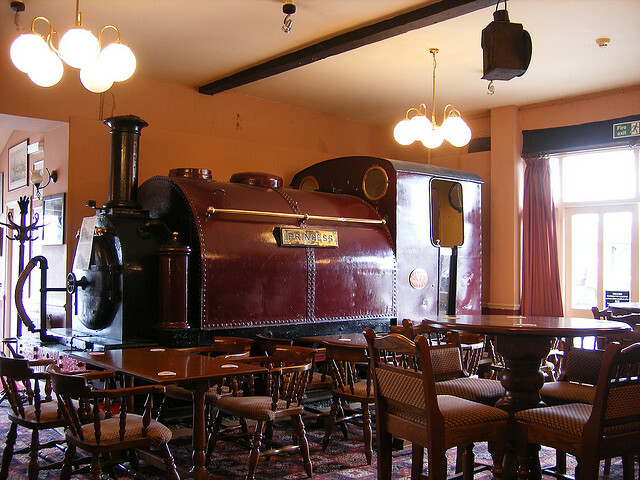 Your author is more used to seeing her as pictured in a pub in Porthmadog, North Wales, and though she's not officially unveiled until 1st March, rumours suggest Princess - a steam engine built in London in 1863 to transport slate along the Ffestiniog Railway from the mines of Blaenau Ffestiniog - will come to Paddington Station today to take up a residency between platforms eight and nine as a promotional exercise. The trip is a sort of homecoming for an engine built in George England's yard at Hatcham Iron Works in New Cross, which produced many steam engines during the period supplying not just to the Ffestiniog, but to other railways such as the Great Western Railway, the Somerset and Dorset Railway and the London Brighton and South Coast Railway. The engines were built to last and Princess' brother, Prince, still serves on the Ffestiniong - the oldest surviving railway company in the world - on a regular basis.